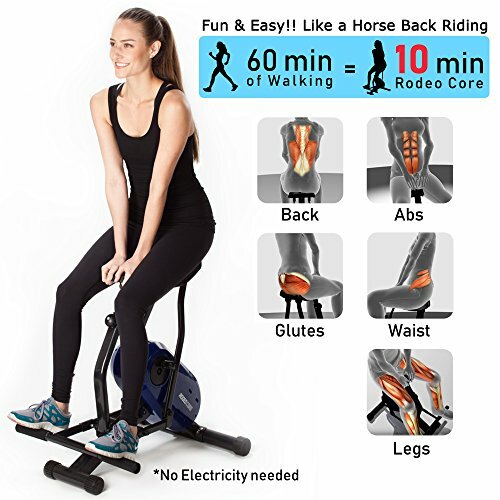 Enjoy an energizing ride while whipping core muscles into shape. The fun and easy way to tone your abs and thighs, using the Rodeo Core is much easier than doing sit-ups. Horseback riding is a great form of exercise because it stimulates the heart and blood vessels, and conditions your muscles. Get the same kind of exercise using the Rodeo Core! Easy to use, just sit down on the saddle and place both feet onto the pedals. By leaning forward and backward along with the saddle's motion, a swinging motion tones muscles in the midsection of your body. Compact and lightweight, it takes up little space and offers three height variations to fit individual shapes. Requires no electricity. Reshapes the back, waist, stomach, and thighs by engaging core and upper leg muscles. Three height variations to suit individual figures. Energy-saving design: uses body weight and motion, no electricity required! Compact and lightweight, it's easy to carry but stays sturdy. Reversible: forward and backward motion. If you have any questions about this product by U.S. Jaclean, contact us by completing and submitting the form below. If you are looking for a specif part number, please include it with your message.